The Great War was not the first one to be documented by pictures, yet it developed a very special relationship with photography. There were - as usual - official photographers who shot in different ways the most striking or the most normal aspects of the trench life, of the soldiers and the guns, of the battlefields or of the frontline, sometimes for propaganda purposes, sometimes to report the reality, sometimes even for military strategy. There were moreover simple soldiers and civilians who captured with their private cameras their personal experience, what happened around them and their neighbors. There were finally the portrait photos exchanged between the soldiers and their family, maybe as attempt to concretize in the pictures the nearness to the beloved. It is a fact that we have today in hand millions of images of the Great War, approaching the Centenary publications follow each other and thanks to the new communications media we can even track and share from our sofa such an amount of materials as never before. A simple research in the web or a tweet - and a picture, a visage of someone living one hundred years ago suddenly appears on our screens. It would be interesting to ask ourselves, how we deal with these images, if we are able to read them – since even the apparent immediacy of the visual communication cannot avoid interpretative questions – and if the easiness in sharing them could be sometimes in inverse proportion to understand their historical, cultural and human message. It is therefore welcomed, any initiative that discusses this topic, analyses and point out the role photography played during the WWI. This is also the case of a forthcoming conference supported by the historical research center CEDOS that will take place in Treviso, 4th April 2014, at 4.00 pm. Entitled Obiettivo Grande Guerra, it aims to analyze how the Great War was depicted – and understood – by the use of photography. Three paper are in program. 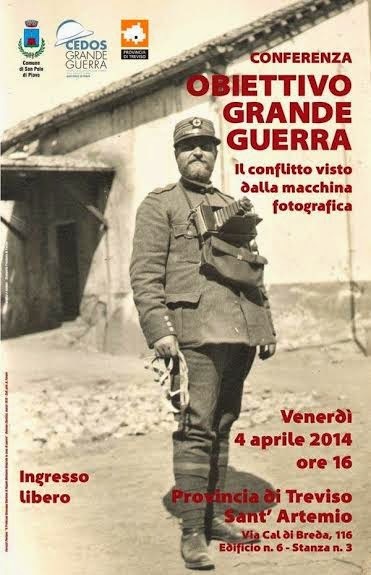 The first one – given by Adriano Favaro, former director of Treviso historical Photo Archive – will concentrate on the history of photography during the years of the WWI considering both its professional and amateur uses. The second paper – by Elisa Ruggiero – will present the historical overview on the aerial photography from the nineteenth up to the twentieth century, disclosing its meanings and techniques. The third one – by Paolo Seno – will illustrate the photo collection of the Austrian officer Karl Pflanzl, focusing in particular on more than 130 pictures taken on Monte Nero and that vividly captured the incredible military and logistic effort of the Austrian Army to protect the eastern Italian front line. Three papers which surely can enable us to move few steps into the knotty relation between Great War and Photography.